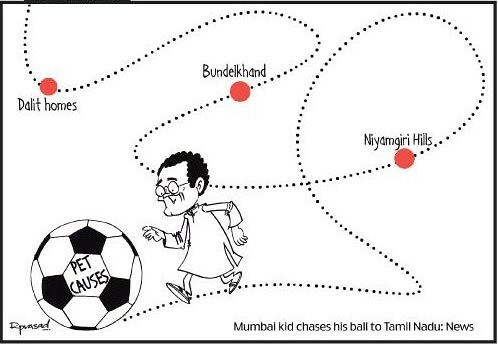 As he trips all over the place, like a little kid with mummy’s ball of wool, the only trouble Rahul Gandhi‘s weltanschauung continues to get from the media is from sharp political cartoonists. Just two of them, actually, and an unlikely media vehicle called People’s Democracy. For the record, Rahul Gandhi’s great grandfather Pandit Jawaharlal Nehru, his father Rajiv Gandhi, his uncle Sanjay Gandhi, and his mother Sonia Gandhi represented Amethi, before he himself was elected from there. And, for the record, Rahul Gandhi’s grandfather Feroze Gandhi, grandmother Indira Gandhi, uncle Arun Nehru and his mother Sonia Gandhi have represented Rae Bareli since. Rahul Gandhi‘s ascension: a foregone conclusion? This entry was posted in Issues and Ideas, Media and tagged Churumuri, Congress, CPM, E.P. 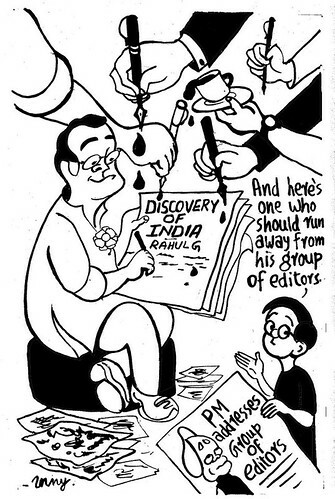 Unny, Feroze Gandhi, Indira Gandhi, Mail Today, Manmohan Singh, Pandit Jawaharlal Nehru, People's Democracy, Prasad Radhakrishnan, Rahul Gandhi, Rajiv Gandhi, Sanjay Gandhi, Sans Serif, Sonia Gandhi, The Indian Express, Unny. Bookmark the permalink. It is a big farce. The latest American politician who went around discussing two americas is the disgraced John Edwards. Hope Rahul baba does not meet same fate. Whats with Churumuri and Rahul Gandhi these days? Too many bashing articles…. By the way, give the prince some credit for taking some pain, travelling across India and seeing at least some things first-hand. Even if he gallivants across Europe, America and Colombia for the next 3 years and returns to India, his gaddi is safe. Rahul will rank just next to Deve Gowda as a PM! The Congress party spokesperson seems to have approved his statement. What a shame. Left hit back with Purulia, since Rahul himself specifically mentioned about the underdevelopment of Purulia during his speech in Kolkata on Monday! BTW, as someone who has spend better part of his life across several villages of Purulia, I am shocked what is the state of Amethi if the place is worse than Purulia. The Congress spokesperson defended Rahul saying CPM was juggling with numbers !! Being an Engineer I want the data before I come to conclusion. And data should be raw data from horse’s mouth and not interpretation. Spurred by this debate and armed with some intelligent querying using google I came across this raw data.. Both the links are from rural development departments of two states in question. This data pertains to census done in 2002. Next census for BPL(Below Poverty Line) is scheduled next year.. so till the next survey results are in we have to use 2002 data. The link given below is data from UP. You can not search for Amethi in 2002. Amethi was carved into a district this year only.. look for sultanpur district which housed Amethi then. As for Rae Bareli.. you had that even in 2002. The link given below is data from WB for the same purposes. This data was part of 2002 BPL census so these two data are comparable. However WB published only household’s below poverty line and not individuals below poverty line. So we can use only household data for comparison. Amethi has 55% families below poverty line and Rae Bareli has 62% families below poverty line. Nehru family was the disaster for India. For 60 years if this family could not solve poverty at their home constituency why do we still have imbeciles licking their feet. India please wake and smell the coffee. Entire problems of India are because of this family. Rahul is probably reading speeches written by Chachaji!!!! written to be read at Amethi and Rae Bareli!!!! And today, the little Pappu got more flak for talking about Hindu “terrorists” as a larger threat to Indian than the Lashkar-e-Toiba. This Pappu has hardly any brains saala. Wow, this is really amazing! This question is one that needs to be asked of Rahul Gandhi. I really hope that a reporter will ask him this in his next interview. Frankly, one would expect that leaders as famous as Rahul Gandhi would turn around their constituencies – they have the clout to do it. Electricity, healthcare facilities, vaccinations – these are things that the clown prince can easily deliver with his clout. If he really puts his mind to it, he can transform the constituency, and the question really needs to be asked as to why it has not happened. I think JL Nehru always ran from Phulpur, near Allahabad.